Heavily armed with up to eight cannons and guided to its target by radar, the Heinkel He 219 Uhu (Eagle Owl) was one of the Luftwaffe's most formidable night fighters. Existing camouflage paint helped Museum specialists recreate the wave pattern elsewhere on the night fighter during its restoration. Specialists compare the original He 219 pattern with a replicated section. Museum specialist Dave Wilson applies the wave pattern of the Heinkel He 219 as part of the aircraft's restoration. A closer look at the lower wing starboard Balkenkreuz of the Heinkel He 219 with its shape laid out with special masking tape. The finished He 219 wing, with the rearward half of the Balkenkreuz left untouched. Curator Evelyn Crellin and Museum specialist Dave Wilson discuss paint finish and upper starboard wing Balkenkreuz on the He 219. This object is on display in the Mary Baker Engen Restoration Hangar at the Steven F. Udvar-Hazy Center in Chantilly, VA. The He 219 has been described as the best night fighter operated in World War II by the German Air Force, the Luftwaffe. It may have been the best night fighter of the war. 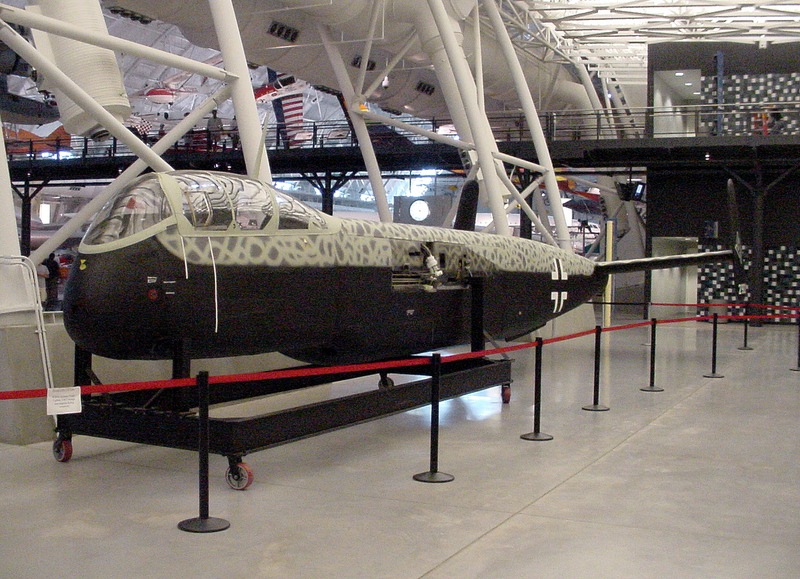 Only the American Northrop P-61 "Black Widow" shares the He 219's unique status of being designed for night operation. The He 219 was fast, maneuverable, and carried devastating firepower. It was the only piston-engined Luftwaffe night fighter which could meet the fast British De Havilland "Mosquito" on equal terms. Advanced features included cannons mounted to fire at an oblique angle, the first steerable nosewheel on an operational German aircraft, and the world's first ejection seats on an operational aircraft. The He 219 was conceived by Ernst Heinkel in the summer of 1940 as Project P.1060, a private-venture multirole fighter. The design was rejected as too radical by the German Aviation Ministry (RLM), where Heinkel had many enemies. By late 1941, night bombing by the British Royal Air Force (RAF) had reached such serious proportions that the existing Junkers Ju 88 and Messerschmitt Bf 110 night fighters were unable to counter it. At the urging of Maj. Gen. Josef Kammhuber, commander of night fighters, the RLM asked Heinkel to redesign the P.1060 as a radar-equipped night fighter. The Germans first used aerial intercept radar successfully against a British night bomber in early 1942. The clumsy radar antennas, which looked like an array of toasting forks, slowed the Ju 88 night fighter by some 40 kph (25 mph). More speed was needed. The faster He 219 V1 prototype flew on November 15, 1942, only 11 months after the design request. Following a competition with the Ju 88 S night fighter in early 1943, the Luftwaffe ordered 300 He 219s. Production was delayed when RAF raids on Heinkel's Rostock and Vienna-Schwechat factories destroyed nearly all of the drawings in March and April 1943. A small batch of preproduction He 219 A-0s was nevertheless delivered to 1st Squadron, 1st Night Fighter Group (I/NJG-1) at Venlo, The Netherlands, in April 1943. In the first operational mission, on the night of June 11/12, 1943, one of these preproduction aircraft, flown by Major Werner Streib and his radio operator, downed five British bombers, four Halifax and one Lancaster. The He 219 was fitted with the combat-tested Telefunken FuG-212 ("FuG" for "Funkgerät" or "radio equipment") "Lichenstein" C-1 intercept radar, first used operationally in early 1942. The radar's range was limited to 4-6 km (3-4 mi), and its coverage was only a 70-degree cone facing forward, so the aircraft worked best in an integrated air defense system with ground radars, radio networks, and ground observers pointing out potential targets. The He 219 was universally popular with its flight and ground crews and was considered a "first-class" aircraft by its British foes. Later versions, like the A-2/R1 in August 1943 (the "R" indicating "Rüstsatz", or "field conversion"), had a "Schräge Musik" (Jazz Music) gun installation, with two MK-108 cannon firing obliquely upward from behind the cockpit. This 30 mm cannon was so powerful that three of its explosive rounds were enough to bring down a heavy bomber like the British Lancaster. The oblique installation allowed attacks to be made on bombers from their vulnerable undersides while avoiding defensive gunfire. "Schräge Musik" proved so effective that it became the preferred armament of the night fighter aces. German night fighters commonly intercepted British bombers by homing in on emissions resulting from security lapses: for instance, identification-friend-or-foe transmitters left on, or navigation and bombing radars radiating continuously. To counter Germany's effective, coordinated use of aerborne and surface radars, Britain began using air-dropped metallized chaff (codenamed "Window"). This blinded both ground radars and the first-generation "Lichtenstein" C-1 aerial radar. Eleven He 219s were built in 1943 and 195 in 1944 at plants in Vienna-Schwechat and Rostock-Marienehe. In the Schwechat plant, some 2,000 prisoners from the Mauthausen concentration camp were employed at the assembly lines. The A-5, the first major He 219 production version, was delayed until March 1944 by various problems. The improved, longer-wavelength Telefunken FuG-220 "Lichtenstein" SN-2 radar was fitted, which was not blinded by chaff. Equipped with a different but still clumsy antenna array, called "Hirschgeweih" or "antlers", this radar provided detection out to 4000 m (3.1 mi). Nevertheless, mid-air collisions with targets at night were still commonplace. RAF bomber losses on night operations in 1943 had been 3.6 percent, despite the use of chaff and other early electronic warfare techniques like active jamming. By March 1944, losses on some raids were as high as 12 percent -- higher than the U.S. Army Air Force's average 11 percent losses in day bombing during the period. On the night of March 30, 1944, for example, German night fighters brought down 94 British bombers involved in a raid on Nurnberg. For anti-Mosquito operations, the He 219 A was stripped down as the A-6 version, attaining 650 kph (404 mph). The He 219 A-7, the next major production version, carried a powerful armament of eight cannon - two 30 mm Rheinmetall MK-108s in the wing roots, two 30 mm Rheinmetall MK-103s and two 20 mm Mauser MK-151/20s in a ventral tray, and two MK-108s in a "Schräge Musik" installation. The A-7/R6, with Junkers Jumo 222A/B engines (2500 hp), was the fastest of the type, attaining 700 kph (435 mph). Despite the aircraft's successes, Erhard Milch, another Heinkel opponent who was chief of aircraft procurement and supply, persuaded the RLM in May 1944 to cancel the whole program. He favored standardization on the multipurpose Junkers Ju 388 and the Focke-Wulf Ta 154 night fighter, which he thought were easier to manufacture but which in fact never saw combat. Nevertheless, Heinkel continued to produce small numbers of the He 219 at Vienna-Schwechat. Fifty-four were built in 1945 and, in all, 294 were constructed and 268 eventually put in service. On November 2/3, 1944, one He 219 downed six bombers in 12 minutes, but attrition of the nightfighter force was increasing. On January 10, 1945, 1st Squadron of Night Fighter Group 1 had 64 He 219s on strength, but only 45 were serviceable. The situation was so bad the He 219 service manuals even included a special volume on how to salvage crashed airplanes. Because of the Luftwaffe's desperate need for the night fighters, and because the He 219 was easy to assemble, six additional aircraft were actually built in the field from spare parts and used operationally without being officially registered. Two of the He 219s, captured by the Russians, were flown in 1946 by Czechoslovakia under the designation LB-79. On June 16, 1945, a team of 25 intelligence officers and men from U.S. Army Air Force (USAAF) Intelligence Service, as part of "Operation LUSTY" (LUftwaffe Secret TechnologY) under Col. Harold E. Watson, took control of three 1st Night Figher Group He 219s at Grove, in South Jutland, Denmark. These aircraft were made flight-worthy by "Watson's Wizzers" and flown to Cherbourg, France. From Cherbourg, under "Project Sea Horse," these aircraft, including He 219 A-2 with construction number [Werksnummer] 290202, was shipped to the United States aboard the Royal Navy ship HMS "Reaper". Together with 21 other captured German aircraft the He 219s were reassembled at Ford Field, Newark, NJ. Reregistered FE-614 (later T2-614; "T2" stood for the Office of Air Force Intelligence) and flown to Freeman Field, Indiana, this aircraft was tested along with another of the three He 219s, an He 219 A-5, construction number [Werksnummer] 290060, registered as FE-612. In 1946, the A-2 was transported to Orchard Place Airport, Park Ridge, Illinois, near the present O'Hare International Airport. Here it was temporarily stored in a vacant U.S. Government factory previously used by Dodge Automobile Company to build Douglas C-54s. Transferred to the Smithsonian's National Air Museum on January 3, 1949, the He 219, together with 82 other aircraft at Park Ridge, was crated and shipped to the Smithsonian's Silver Hill, MD., storage facility in early 1955. The He 219 A-2 wing is being restored and will be re-assmebled with the fuselage and engines currently on display at the Udvar-Hazy Center. Boeing B-29 Superfortress "Enola Gay"